Father’s Day comes around once a year and is a time to celebrate the guy who brought you into this world. Besides just doing that good deed, he may have taught you a thing or two about survival as well. 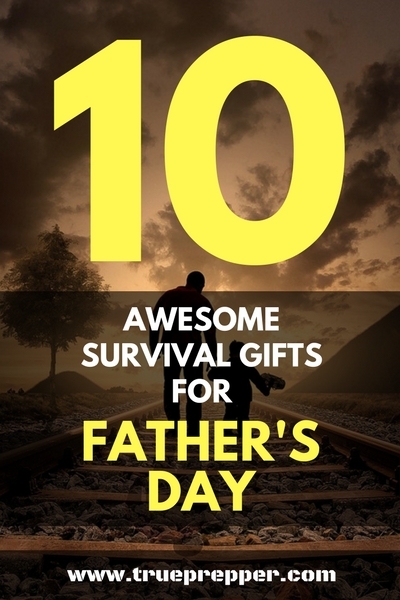 Looking to give him a survival related gift that he will actually use and enjoy? We did the heavy lifting for you and have your list ready to go. 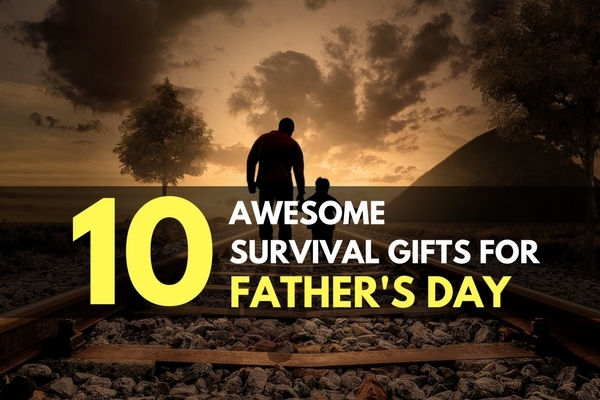 Listed in order of how much they cost, each one of these would make a great gift for the survivalist or prepping dad. If you’re a dad feel free to share so you can drop a ‘hint’- you know you are hard to shop for! Feel free to let us know what you would hope for if it didn’t make our list, so you can help all the other dads dodge the neckties get the stuff they really want. 23 flavors of diversion in a can. The Dr. Pepper diversion safe is a great inexpensive gift for anyone who could use an inconspicuous survival cache. Burglars would never take the time to check this in a home. And it stands unnoticed if you decide to take it to the office. A sure hit for any dad serious about survival or preparedness, or just looking for a good place to hide something. Any dad would like to have around some rescue tape- whether they are stashing it in a car emergency kit or their everyday tool kit. It is one of the best tapes for fixing pipes, hoses, or electrical lines since it can seal leaky pipes and insulate wires instantly. Unlike electrical tape, it can handle high temperatures. Dealerships should be adding these to every key they hand out. It is a seat belt cutter and car window breaker in one compact tool that is meant to go with your car keys. If you are in an accident and need to get out of your car fast, having this handy could very well save your life. You can pick out the color, but we recommend a high visibility color like safety yellow or hazard orange. Write anywhere- even in space! The Fisher space pen has been around for a while, but it is still no less of a marvel. A pen able to write at any angle with a solid flow of ink is a great thing to keep in your everday carry (EDC) loadout. When you are in a survival situation, the last thing you want is a pen that doesn’t write when you need it to. The space pen is about as reliable as they come, and makes a great gift for a wide range of survivalist dads. Socks are one of those things you can’t run out of as a prepper or survivalist. A good pair of wool socks can be lifesaving. They provide warmth even when wet, are durable and comfortable, and are antimicrobial. If you are like me, you want some of these rolled up in a skivvy roll with every kit you go with. The Darn Tough socks listed below are made in America and very highly rated- Dad won’t be disappointed! The TACT Bivvy by Survival Frog is an emergency sleeping bag that is very lightweight and portable. It is a great item to include in bug out bags, car kits, and survival kits. It also makes sense to have one of these handy as a spare if you go camping often. The bivvy is less than 5 ounces and could be just the thing your dad will need if he finds himself needing shelter quick. This one is for the bushcraft oriented survivalist. A folding saw easily fits into many types of kits, and opens up all sorts of survival possibilities in the woods. Bahco is made in Sweden, and they know their blades and saws. If your pops has an adventurous spirit and loves the woods, this might be just the gift for him. The Ontario RAT is one of the most well known full tang bushcraft knives, and the folding version is just as beloved. Knife collectors agree that this is one of the best folders to own and use on a regular basis, and the price is unbeatable. I’ve got this one on my own wish list to use as my new everyday knife. A quality compass is a great addition for any survivalist. If your pops is still planning on popping out the cheap button compass from his survival bracelet in an emergency, you may want to look at upgrading him to the real thing. The Silva Ranger has stood the test of time as one of the most reliable compasses on the market. It easily allows both map and hand navigation and has all the features you could want with a compass. This Paratus Operator’s Pack is a great bag for everyday or bug out uses. The compartmentalization options lets you organize what you pack easily, and have rapid access to it all. The MOLLE exterior will allow you to add on or remove kit modules as you need them. Dad will love this roomy pack as an upgrade to their existing bug out bag or use everyday. The best thing you can give your dad for father’s day is a little time. Catch up with him over a few beers or just hang out and reminisce on old times. Letting your father, grandfather, or husband know how much they mean to you can go a long way with the right gift. Make Father’s Day special for the father in your life. Keep exploring, stay prepared, and be safe.